Sachin Dev Burman as a composer had a liking for folk tunes and the softness of sounds of nature was captured in his compositions. Whenever his compositions were studied in the commercial films there was limitation relating to the immense musical talent because there were preferences of the producers, actors and other groups of people. But when it came to realistic films, probably SD Burman’s best tunes were created. Mohammad Rafi as a singer had the greatest range and modulation in respect of singing. 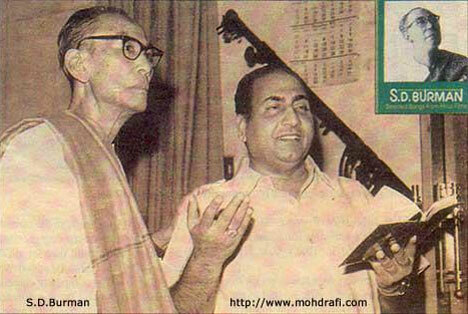 So SD Burman’s songs in realistic films with Mohammad Rafi created magic. In Dilip Kumar and Bimal Roy’s Devdas, SD Burman used Talat Mehmood for the song “mitwa”. It was probably one of the best tragic songs Talat Mehmood had ever sung. SD Burman was successful in extracting the pathos in a rural background. Lajwanti, Bandini and Sujata were female-centric films. So SD Burman composed songs for the female singers. Talat Mehmood’s “jalte hai jiske liye” was impressive in Sujata. Guru Dutt’s Pyaasa was a landmark film where SD Burman and Mohammad Rafi combination touched the souls of people. “yeh mahalaon yeh takhton yeh taajon ki duniya” sung by Rafi and written by Sahir Ludiyanvi had philosophical dimension. Rafi’s s other songs in the film were masterpieces like “hum aapki aankho me”, “yeh hanste hue phool”, etc. Rafi SD Burman combination followed the pathos andaz in Guru Dutt’s Kagaz Ke Phool. Rafi’s song “dekhi zamaane ki yaari, bichre sabhi baari baari” was one of the best songs speaking about the reality of life. Philosophy, pathos and passion got merged into one. The other songs “hum tum jise kehten hai”, “ulte seedhe dao lagae” were equally impressive. In Bimal Roy’s Benazir, all the songs of Rafi SD Burman combination were very impressive including “dil me ek jaane tamanna”, “aaj shishe me baar baar”, “le gayi ek haseena”, “mai shola hoon”, etc. Ashok Kumar and Shashi Kapoor were very impressive in the film and Rafi’s songs were brilliant by musical standards. Meri Surat Teri Ankhen was another film where SD Burman could display his classical talent. Rafi and Manna Dey were used to their potentials. Songs like “pucho na kaise maine rain bitayi” in ahir bhairav, “naache man mowra”, “tere bin sune” were masterpieces which showed the pathos andaz of Ashok Kumar in the film. Rafi was used in immense numbers of films of Dev Anand, in Dharmender’s Ishq Par Zor Nahi, Joy Mukherjee’s Ziddi, Vinod Mehra’s Anurag and majority of them dominated the chartbusters in the 1950s and 1960s. Many listeners must have Rafi’s rendition of SD Burman compositions “yeh dil diwana hai”, “mehbooba teri tasveer”, “teri surat se na milti hai kisiki surat”, “janu kya mera dil ab kahan kho gaya”. The songs were very melodious. References had not been made in the article because the article was devoted to the realistic andaz of Rafi and SD Burman. All the films and the songs mentioned above require publicity and restoration. This entry was posted on Sunday, January 20th, 2013 at 5:16 pm	and is filed under Meri Awaaz Suno. You can follow any responses to this entry through the RSS 2.0 feed. You can leave a response, or trackback from your own site. SDB has used Mohd. Rafi on uncountable occasions.Despite Kishore kumar was DEV’s voice,SDB used RAFIJI for many songs of DEV,even more than KK in films like Kali pani,Kala Bazar,Tere gharke samne,Bambayi ka babu,Guide, jewel thief, Teen Deviyan,Nau do gyara& many more.For DEV SJ, Salilji,Jai Dev,OPN used RAFIJI only. SDB also used RAFIJI in Aradhana,Talash,Ishq par jor nahi,Abhiman,Anurag latter. , It was RDB who even though used RAFI intelligently in Pyar ka mosam, Yadoki barat,Hum kisise kam nahi,The train, Ratonka raja but RDB used KK for any artist some of the songs were very popular,but it deteriorated the quality of songs.In fact after RAFI regained form it was expected from RDB,like LP,Rajesh Roshan, some RAFI HITS could have been created with LATAJI, Ashaji .But it could not happen. I think a lot of the comments say it all that the most memmorable songs were the ones with SD Burman and Mohd Rafi so even if the father and son duo decided to stop using Mohd Rafi in the 1970’s it most definitely was at their or the films loss because that kind of magic was never recreated with Kishore Kumar who incidentally I still consider as a karaoke singer and he doesn’t have any where near the same finesse that Mohd Rafi did. RAFISAAB expired on 31July 1980.Former PRIME MINISTER V.P.SING was the then CHIEF MINISTER of U.P.In the condolence meeting of U.P.Assembly it was said “MOHD. RAFI CONTRIBUTED A LOT FOR NATIONAL INTEGRATION OF INDIA. The Union Govt have neglected the contribution of RAFIJI.We argue the new Central GOVT. to confer BHARAT –RATNA posthumously to this greatest singer of the planet. And we can go on and on, as I said earlier, please remember that they have recorded 200+ songs with Rafi which is a big number. I don’t think we should bash them and club them with anti-Rafi composers like AB or Salil. By the way, I agree that Dada Burman would not have survived, if he had not used Rafi the way he did from 1957 – 65. Films like ”Insaan jag utha”or”Dr.Vidya”may not be considered as 100%realistic films,but duets”chandsa mukhada kyun sharmaya”and ”mai kal phir milungi”(which is similar to ”kisiki muhabbatme from ”kaise kahun”)are unforgettable.Subject may be different,i cannot prevent myself from mentioning here”Hum to tumpar dilse fida yaar dedo hame kasme khuda”from”bewqqoof”which is picturised on comedian late I.S.Johar.Looking to the SD-Rafi combination one can conclude that SD”S Rafi was a “Controlled and swwet “. dr. chatterji, I totaly agree with you that there is not any emotion of human beings which rafisahab has not captured in his career. There is a song for all occassions. It does upset me greatly that he has never properly been recognised for his contribution to indian music especially when the success of his work plus his popularity speaks for itself. I think the indian goverment needs to be lobbied and reminded by his fans that this is an issue that will not be forgotten and the highest award should be given in his name. His voice is a magic. Nobody can be Mohammad Rafi until the God wishes Himself. He was God’s blessing to mankind. There will be no another Mohammad Rafi till doom’s day. It was a God sent voice to earth. Believe my these lines if you believe in God. Yes, truly Rafisahab’s songs act as tonic for the sick persons which can help for recovery. There is hardly any emotion of human beings which Rafisahab had not captured in his illustrious career of singing for 37 years. dear hassan saab you rightly say forget all issues and listen to our dear rafi saab’s songs only. sdb ke sath rafi saheb ne anek gane gaye the, wo sabhi hit bhi hua. ye gane sirf sdb ka nam roshan kiya bulki us film ke nayak ka bhi uncha kiya. iska kredit kisko jata hei, rafi saheb ko. dev saheb ke black & white film mein anek hit gane rafi saheb ne gaya. guide film ki gane sdb career ki ek milestone hei. ek magazine mein hindi film jagat ke abhi tak ka 20 mashoor gane unke gayak ki chunav hua dha. isi list mein do gane rafi saheb ki guide film ke dhe. usi selection mein rafi saheb dhe topper. roshanji ki direction mein koi ek film ke dhe (man re…….). sdb jo awaz ki talash mein dha wo awaz rafi saheb mein mila bharosa kiya. rafi saheb ne bhi apne sureeli aur jadoogari awaz se sdb ji ka dil bhar diya. itna sab kuch hum suruhat mein dekha dha, wo bad mein dekne ko nahi mila. beech mein chuachoot ki bimari kahan se aya. ye bimari film jagat mein bhi hein ? viswas nahin ho raha hein. suruhat mein rdb ne bhi rafi saheb gana gavaya dha. kuch mashoor film teesri manzil, pyaka mausam, karavan, hum kisi se kam nahim etc. mein rafi saheb ko gane ke mauka mila wo bhi us film ke producer/director ke compulsion ki vajah se. ye sab gane rdb ko kitna nam dilaya dha. hum kisi se kum nahin film ka gana”kya hua tera wada” ko film fare & National award mila. uske bad rdb ko rafi saheb ki mahanatha ki bare mein sochne ka aur use apna ek chahnewala gayak ki list mein rakna suru kiya. suna tha rafi saheb aur lataji ki beech mein mein roylaty ki bare mein kuch asantusht baten hua dha. takriban char sal tak donon ne milke duet gane nahi gaye. phir bhi rafi saheb ki position pahle se bhi behatar hua aur anya gayika, ashaji, sumanji,sharadaji ke sath rafi saheb ka duet gane chalta raha. rafi saheb ki gunvatha janenewale music directors rafi saheb ko kabhi bhi choda nahin. akir, sdbji ne rafi saheb aur lataji ke beech mein samjodha karaya aur abhiman film mein ek mashoor gane “teri bindiyare” gane bhi gaye. rafi saheb jaise “anmol ratan” ko kon neglect karega? koi nahin. haan yeh sahi hai ki sd daa rafi sahab ko hi sabhi gaano mein lena chahate the aaradhana film mein, jab sd daa ki tabiyat theek nahi thi aur rd ne music haath mein liyaa aur kishore daa ko pehla preference diya. jo sdb sahab ki jaankaari mein nahi tha. aaj bhi jab gazhal sunta hoon hum bekhudi mein tumko pukare chale gaye, yaa phir sar jo tera chakraaye to woh sunhara jamaana yaad aa jaata hsi aankhun ke saaamne. salaam sdb/rafi sahab dono ko. In reply to the question of SD Burman using Rafi very rarely in 1970s, the title of the article is related to realistic films. Rightly interpreting the films listed also creates an inference that the films were classic films. It was a pity that SD Burman, did not use Rafi’s potentials in 1970s. But in a collective note there is no shadow of doubt that standard of music of 1970s were very ordinary. There cannot be any comparison of standard of SD Burman in the 1950s and standard of SD Burman of 1970s. SD Burman is remembered for his brilliance in the film Pyaasa or Kagaz Ka Phool. If the quality of words of lyricists of 1950s are compared with 1970s the standard set up by Shailendra, Hasrat Jaipuri, Sahir Ludhiyanvi, Shakeel Badayani were uncomparable. Very mediocre lyrics came up in the 1970s. Songs “tera picha na mai chorunga soniye”, these songs were very ordinary, and SD Burman’s music in films like Jugnu was the strong -point for the film, viewers wanted to see action and Dharmender’s action fulfilled their tastes. Stalwarts like Bimal Roy, Guru Dutt, Nitin Bose, were not there in the 1970s. So motivation of catering music to the taste of simple middle-class person was not there in the 1970s. Realistic films were made by art film directors like Shyam Benegal, Govind Nihalini were SD Burman had no role to play. In context non-utilization of Rafi, if any composer had done that, including SD Burman in the 1970s, it was a deliberate mistake and monumental music. It is because Rafi was the most-trained and most versatile singer ever to have graced the Indian soil in the world music. There was deliberate reason for not mentioning Guide. I know Rafi’s 3 songs “tere mere sapne”, “kya se kya ho gaya”, “din dhal jaye” are remembered from the point of Rafi’s excellent emotional rendition. But the article was focussed towards realistic films. Dev Anand by no standard was a exponent of realistic stories. His albert style of hair, five buttons near the collar, none of the characteristics had anything to do with the lives of middle-class people. Dev Anand was a star along with Raj Kapoor and Dilip Kumar and had a huge fan -following. The article is focussed towards realistic actors like Balraj Sahani, Guru Dutt, for whom style and mannerisms did not matter. SD Burman also did not have any compulsion for any form of songs for the masses. Those films did bring the best of SD Burman. Rafi was versatile. It did not matter in which type of film he was singing. His songs created magic. How come you forgot to mention the melodious, remarkable and un-forgetable songs of “Guide”? may i ask so what stopped sdb and son rdb from taking rafi saaheb from 70 onwards up to 75? Is it the ill health of sdb, the ego of rdb or the great fear that ‘if’ they give songs to incomparable rafi, it will become a historic intervention like guide or a teestri manzil ? did the father and the son had an ego bust after their musical successes and did they think giving songs to rafi would undermine the path of their favourite singer who was being heavily promoted by them and their regional supporters. history and life teaches us some valid lessons – after all. after sdb passed away and laxmikant pyarelal giving hits after hits with mohd rafi, rdb had to go to rafi villa to persuade the titan – to work with him once again. needless to say, the pair created the teesri manzil magic to some extent once again and also sang a high pitched successful duet. but, the downhill of rdb continued and bappi lahiri took over from the son – who was left alone by many who were close to him. in the alternative the composer with his many flops would have had to pack his baggage like the other md who migrated to new delhi in the fifties. the sad fact remains that sdb tried his best to keep mohd rafi out inspite of rafi singing the best and difficult songs for him. another actor who during the period rarely used rafi was dev anand . he added the ‘most’ flops to his career during the period it must be stated and not even five songs of the actor can be recalled now. as udit narayan rightly said : ye industry kisi ka nahin hai doston. SD Burman’s compositions which were created from the fertile soils of Tripura and West Bengal got their best expression in the realistic films. So Devdas, Pyaasa, Bandini, Sujata, Kagaz Ka Phool, had the best of SD Burman embedded in them. Mohammad Rafi had 2 dimensions. Firstly he had the merit of understanding the requirement of the composer. That is the reason his song for Shankar Jaikishan different for his song for Naushad Ali and again SD Burman. Rafi’s second dimension was related to entering the skin of the actor who gave lips in the film. Whether it was Dilip Kumar, or Guru Dutta or Johnny Walker he could convey to the listeners that the song was related to the actor. So when SD Burman and Rafi met together in realistic films the combination created history.